Watching the new film Like Crazy, it’s hard not to think that on at least a few levels, this is the movie (500) Days of Summer wanted to be. That is, a love story for young people, many of whom feel like they’re too cool for conventional Hollywood romances, and that those films just don’t speak to them. But whereas (500) Days had stars with indie cred (Joseph Gordon Levitt and Zooey Deschanel), a hip soundtrack, and a contemporary aesthetic, it was just a little too self-aware to be as beloved as it so wanted to be. On the other hand, Like Crazy tells a more realistic story of young love. Its stars are less well known (for now, anyway), the action unfolds without the hipster accompaniment of the Smiths, Feist, and Regina Spektor, and its natural aesthetic (handheld camerawork, completely improvised dialogue, etc.) make for an almost too obvious counterpart (despite a twee trailer that features music by Stars and Ingrid Michaelson). But is it a better movie? 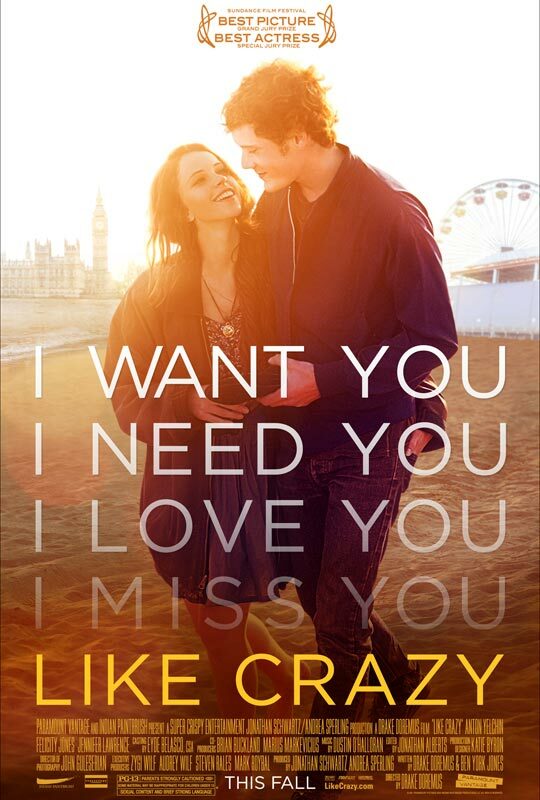 In Like Crazy, two college students, American Tom and British Anna (Anton Yelchin and Felicity Jones), fall for each other hard and fast. When the school year is over, and Anna must return to the U.K. (per the limitations of her student visa), she decides to disregard the law (and the advice of her parents and lawyer) to stay with Tom. This gets her barred from the U.S., and puts a real strain on the relationship (to put it mildly). Is the bond between these two strong enough to survive time and distance apart? If you’ve ever been in a similar relationship, then you know just how challenging the situation can be, and how painful. Like Crazy doesn’t shy away from this, focusing on all the minutiae that can eat away at a couple (missed calls, ignored or poorly timed text messages, etc. ), and presenting more-available options for both characters (X-Men: First Class‘ Jennifer Lawrence and Charlie Bewley, of the Twilight movies). I won’t spoil whether Tom and/or Anna remain loyal, but yeah … over the course of four years, it’s tough to be separated from the one you love. Drake Doremus, Like Crazy‘s director, based the film on his own true life experience, and he’s clearly rooting for these two to make it. If only I could root as hard as he is. After a while, the initial spark that burns so brightly (between our heroes and the film itself) fades. Watching Like Crazy, I felt like Tom and Anna themselves had given up, so as hard as they try to make things work is as hard as I had to try to believe that they actually wanted to be together. In the end, I just didn’t buy it. And once I made the decision to not root for Tom and Anna to make it, I couldn’t wait for the movie to end. Like Crazy only has a 90-minute running time, but its last third makes it seem even longer. Which isn’t to say I didn’t enjoy parts of the film. Like Crazy is frustrating, but it features a totally likeable and winning performance by Jones that announces her as an actress to watch (just like Martha Marcy May Marlene did with Elizabeth Olsen). Adorable, modern, real, and almost the anti-Zooey (in that she doesn’t have that dorky/cute thing going for her), Jones is a big reason why Like Crazy works when it does, particularly in the first third. Even though the film lets her down, Jones is someone viewers can easily fall for. Chances are good we’ll have plenty of other occasions to do so in the future. For now, though, Jones is in a film that, like (500) Days of Summer isn’t as good as it wants to be. I’m giving Like Crazy a B–.